This is a nice alternative to spicy beef meatballs. The Masaman sauce has a great creamy but full flavour and works really well – that classic Thai mix of sweet, spice, heat and salt in the sauce really makes this dish a classic. I make my own Masaman curry paste for this dish, but you can buy very acceptable Thai pastes in the supermarkets. Add pork, breadcrumbs, garam masala, coriander and plenty of salt & pepper. Mix well with your hands. Take a tablespoon of the mixture at a time and form into balls no bigger than a golf ball (this is easiest with wet hands). Makes around 24. In a large pan, fry off the Masaman paste for a couple of minutes. Add the galangal and fry for another minute before adding the tomatoes, sugar and coconut milk. 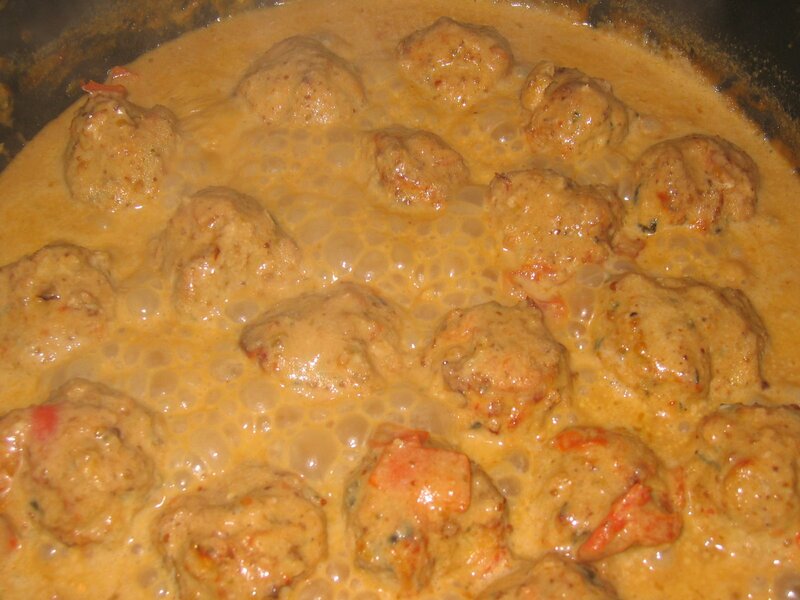 Add the meatballs to the sauce and baste for 15-20 minutes – add a little water or stock if the sauce becomes too thick.